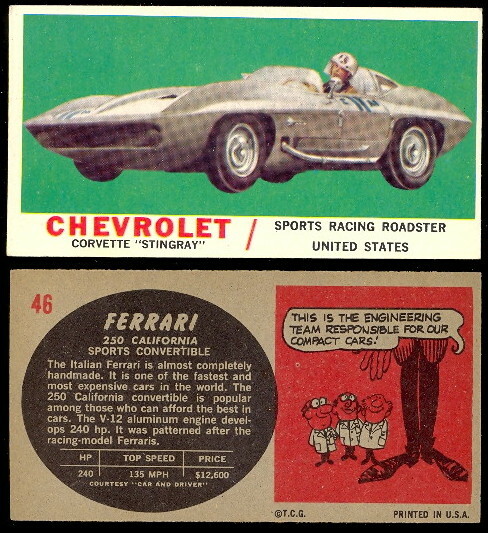 The 1961 Topps Sports Cars is a 66 card set that features many different types of automobiles. The set includes many popular sports cars from all over the world including Maserati, Ferrari, Mercedes Benz, Austin Healey, Chevrolet Corvette Stingray, and many others. The set was issued in 1961 and the cards measure 2-1/2" x 4-3/4" in size. The fronts feature color drawings of the sports cars and the backs contain descriptions.